SEOUL, Sept. 28 (Yonhap) — For many tech-savvy youngsters who are eager to share unique photo spots with their social media friends, Samcheong-dong in central Seoul is a must-go place. And for those who wish to simply enjoy a different atmosphere, the place also offers a rare experience of going back in time. Located on the east side of Gyeongbok Palace and the presidential office Cheong Wa Dae to the north of the old palace, Samcheong-dong was once considered one of less developed places and out of fashion in Seoul as the area had long been subject to preservation and restrictions due to the many historical sites and highly secured government facilities in the vicinity. Even to date, most buildings in the area, old and new, are less than five stories high, preventing any direct view of the presidential office from high above. Such restrictions had effectively discouraged any meaningful development projects, in turn preserving the old and out-of-date houses and buildings for many years. Then people began to realize old was gold. The first ones to come were young South Koreans who, like their foreign peers now, enjoyed discovering their own unique spots in a run-down part of the city then avoided by many that ensured some privacy. Then came new shop owners and developers who apparently saw a bright future for one of the oldest towns in Seoul, capital of the country since 1392 when the Joseon Dynasty (1392-1910) was founded. But due to development restrictions, they were forced to modify the old houses and little buildings rather than rebuilding, simply giving a new, clean look to many that existed as long as the country’s modern history. Now these new establishments with their old essence intact are what attracting thousands of local and foreign visitors daily. “This place has something you don’t see very often anywhere else. We are used to flashy, flashy places like Gangnam, but this is not something we can see anywhere else in the world,” said Georgina Sheppard. Gangnam is one of the well known places in Seoul, located in the heart of the plush southern part of the capital, for its many high and fancy skyscrapers. The 28-year-old British employee of a foreign airline says her work has brought her to Korea three times. “This is my first time to this area and I thought it was interesting to see these perfume or clothing shops, which you wouldn’t expect to see in such small and old buildings,” she said. For many, like Isabella Liew from Kuala Lumpur, Malaysia, such shops in old buildings with a trendy look that carry globally well-known products create the best photograph spots that will give them the right to brag about visiting the world’s most unique shop of any given global brand. 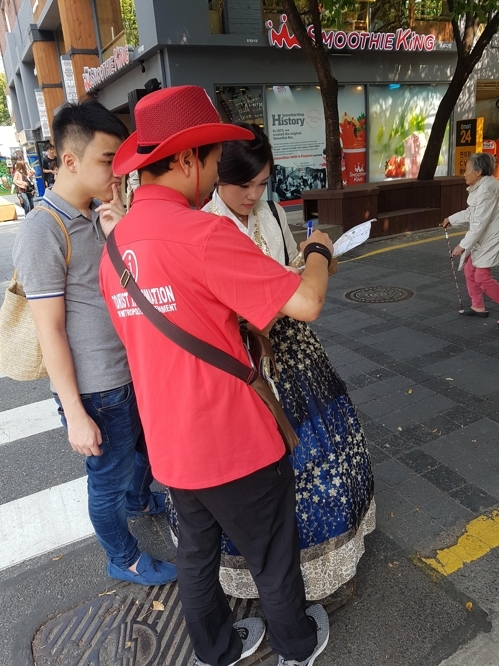 “I like this place and the experience of visiting this place because I can take many beautiful pictures,” said the 22-year-old, clad in traditional Korean clothing of Hanbok, a must try item for young Koreans and foreign visitors seeking to take their unique selfies. Liew noted it was the pictures of her friends back home taken here that brought them to the still less-known part of Seoul. “We didn’t know anything about this place or Hanbok. We only saw them in my friends’ pictures, but I certainly think they were worth a trip,” she said. To help those unfamiliar with the location and what it has to offer, the Seoul city government daily places an average three pairs of two tour guides along the short Samcheong Road that stretches 1.6 kilometers or 1 mile from the southeastern end of Gyeongbok Palace to the foot of Samcheong Park. “We used to see way more Koreans, but now we have far more foreign visitors than Koreans,” Sohn Hyeong-joon, a 27-year-old tour guide, said after helping Liew and her 23-year-old friend Ken Cheng find the entrance to Gyeongbok Palace. 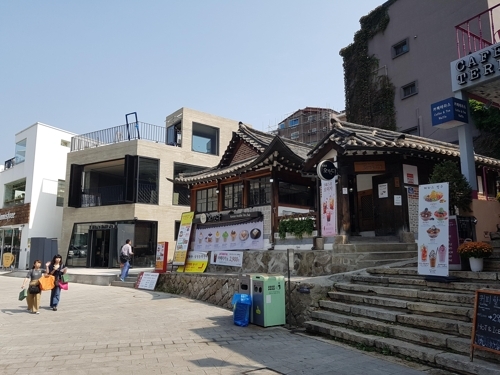 Sohn said it was not just the street or the small shops but many other unique and traditional places, such as Gyengbok Palace and the Bukchon Hanok Village, that daily attracted some 5,000 foreign tourists to the area. There are also some 60 private art galleries that offer free admission in Samcheong-dong, according to Sohn. Such a large number of private galleries have apparently been inspired by the National Museum of Modern and Contemporary Art that sits directly across the Samcheong Road from the eastern gate of Gyeongbok Palace. Adding another unique experience and things to see, the presidential office recently removed a late-night curfew on the road that splits from the main Samcheong Road to directly reach Cheong Wa Dae, offering a 24-hour access to the front of the presidential office and to another newly springing old town on the western side of Gyeongbok Palace, Seochon, which literally means a west village.